Layout saving/restoring is a feature that was introduced in i3 v4.8. You can save the layout of either a single workspace or an entire output (e.g. LVDS1). Of course, you can repeat this step multiple times if you want to save/restore multiple workspaces/outputs. Please note that the output of i3-save-tree(1) is NOT useful until you manually modify it — you need to tell i3 how to match/distinguish windows (for example based on their WM_CLASS, title, etc.). By default, all the different window properties are included in the output, but commented out. This is partly to avoid relying on heuristics and partly to make you aware how i3 works so that you can easily solve layout restoring problems. How to modify the file manually is described in [EditingLayoutFiles]. When an application opens a window that matches the specified swallow criteria, it will be placed in the corresponding placeholder window. We say it gets swallowed by the placeholder container, hence the term. Note: Swallowing windows into unsatisfied placeholder windows takes precedence over assignment rules. For example, if you assign all Emacs windows to workspace 1 in your i3 configuration file, but there is a placeholder window on workspace 2 which matches Emacs as well, your newly started Emacs window will end up in the placeholder window on workspace 2. The placeholder windows are just regular windows, so feel free to move them around or close them, for example. The append_layout command is used to load a layout file into i3. It accepts a path (relative to i3’s current working directory or absolute) to a JSON file. i3-msg "workspace 1; append_layout /home/michael/.i3/workspace-1.json"
exec --no-startup-id "i3-msg 'workspace 1; append_layout /home/michael/.i3/workspace-1.json'"
The structure of this JSON file looks a lot like the TREE reply, see https://build.i3wm.org/docs/ipc.html#_tree_reply for documentation on that. Some properties are excluded because they are not relevant when restoring a layout. Here you can see that i3 will require both the class and the instance to match. Therefore, if you just start Emacs via dmenu, it will not get swallowed by that container. Only if you start Emacs with the proper instance name (emacs24 --name notmuch), it will get swallowed. _NET_WM_NAME(UTF8_STRING) = "Change Foreground Color"
The first part of WM_CLASS is the "instance" (gimp-2.8 in this case), the second part is the "class" (Gimp-2.8 in this case). "title" matches against _NET_WM_NAME and "window_role" matches against WM_WINDOW_ROLE. In general, you should try to be as specific as possible in your swallow criteria. Try to use criteria that match one window and only one window, to have a reliable startup procedure. 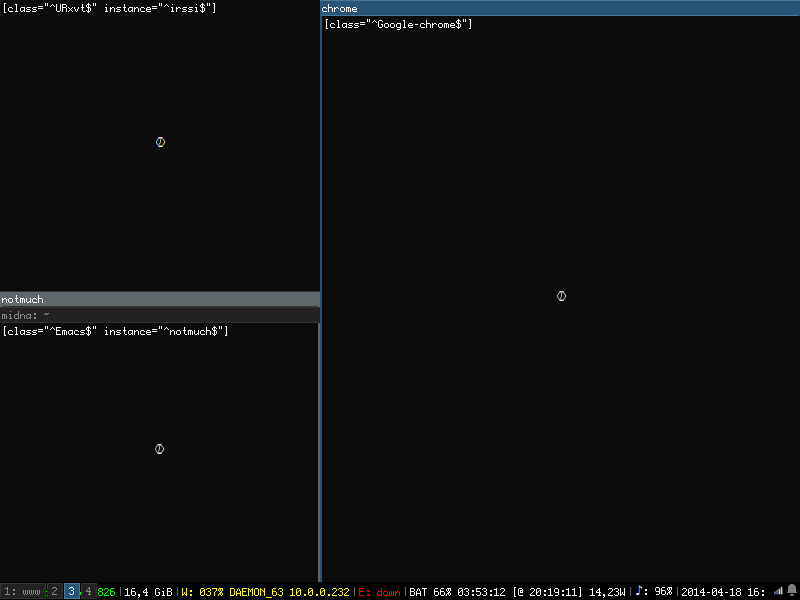 // Matches either Emacs or Gvim, whichever one is started first. Layout files contain multiple “JSON texts” at the top level. The JSON standard doesn’t prohibit this, but in practice most JSON parsers only allow precisely one “text” per document/file, and will mark multiple texts as invalid JSON. Layout files contain comments which are not allowed by the JSON standard, but are understood by many parsers. Both of these deviations from the norm are to make manual editing by humans easier. In case you are writing a more elaborate tool for manipulating these layouts, you can either use a JSON parser that supports these deviations (for example libyajl), transform the layout file to a JSON-conforming file, or submit a patch to make i3-save-tree(1) optionally output standard-conforming JSON. When using i3-save-tree with the --workspace switch, only the contents of the workspace will be dumped. This means that properties of the workspace itself will be lost. If you use the title attribute to match a window and find that it doesn’t work or only works sometimes, the reason might be that the application sets the title only after making the window visible. This will be especially true for programs running inside terminal emulators, e.g., urxvt -e irssi when matching on title: "irssi".